Fascinated by this complex nation, perched at the forefront of a resurgent Africa, writer Daniel Metcalfe travelled to Angola to explore the country for himself. Ebullient and proud, and often unwilling to dwell on its past, Angola has a large army, a hunger for wealth and a need to prove itself on the continent. But as Metcalfe also discovers, it has some of the most grinding poverty in Africa as few Angolans have reaped the rewards of the peace. Nonetheless, amid Angola’s brash reality, Metcalfe finds there is a place for a traveller who isn’t there to make a quick buck. Crossing the country as ordinary Angolans do, talking to tribal elders, oil workers, mine clearers, street children, he encounters a place of extremes, where cynicism and excess go hand-in-hand with great hospitality and ingenuity. Metcalfe also reveals a colourful history of pirates and slave traders, capuchin monks, syncretic Christian cults and elaborate spirit masks. This is an Angola that symbolises nothing less than a broader turning point between the continents, the repositioning of the rich developed world versus Africa. It is a land that, until now, few outsiders have managed to unlock. Metcalfe cleverly weaves in Angola’s colonial history, civil war and rapid rise of the nouveau riche…Angola’s extraordinary cocktail of corruption, oil wealth, destitution and post-colonial blues adds an altogether grittier, dimension – this is not for armchair travellers. An invigorating, eye-opening and fascinating study of a booming but dysfunctional country that embodies the new Africa. As [Angola] is unlikely to be geared towards tourism any time soon, this travelogue is all the more valuable. Metcalfe travels across the country, becoming immersed on its ‘confusao’ – the spirit of almost blameless anarchy that runs through Angolan life. Like the kuduro music favoured by the taxi drivers, you just have to keep up with the beat. A rich and fascinating book about an overlooked African powerhouse by a travel writer of rare talent. Travelling through cities and communities still recovering from more than twenty years of civil war, Daniel Metcalfe elegantly weaves Angola’s tragic history into the stories of the extraordinary cast of characters he meets on his journey. 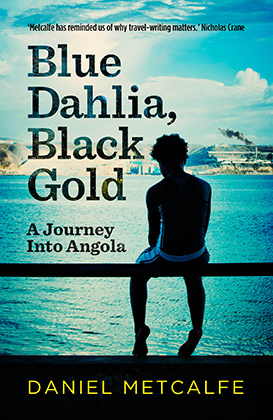 Blue Dahlia, Black Gold is a vital mosaic of a country wracked by corruption and poverty but which, against many odds, is emerging into an African powerhouse.